In case you haven’t heard – we’re going to the Super Bowl! Well, not me, but the Steelers are. One of the items on my bucket list was to go to a Super Bowl game. This would be a great one! Oh man, can you imagine? But, it’s not as easy as it sounds. You can’t just get tickets and go. Well, you can but only if you have a lot of money. One of the guys I work with had a shot at a Super Bowl package if the Patriots made it (which they didn’t – in your face Tom Brady! Now go get a haircut). For 10 grand, he and his wife could fly there and back with the team on their jet, stay in the team hotel, get 2 tix to the game, all access pass to the team locker room, attend the after party with the team and get unlimited amounts of chocolate raining down on you wherever you go. Ok, maybe not that last one but seriously, doesn’t that sound frickin’ awesome! Picture it – me and CJ flying down to Dallas on the Steelers jet. I’m sitting next to Troy, putting conditioner in his hair. CJ ‘s conferring with Mike Tomlin, helping him decide which plays to run. Big Ben and James Harrison come over to join us for a drink. Hines Ward grills up some burgers and gives us all fashion tips. Then we land and head to the hotel where our room is next door to Ben’s (hey, someone’s gotta keep an eye on him making sure he doesn’t get in to anymore trouble). The day of the game we all head to the locker room where CJ gives a rousing pre-game pep talk and I take pictures. Lots of pictures. We head up to our box seats and find that Jerry Jones is our waiter. Move it JJ, I want my hot dog as soon as it’s off the grill and not a minute later! The game is awesome and the Steelers beat the Packers by 3 points which makes victory all the more exciting and sweet. Everyone is hugging and Art Rooney throws C-notes in the air in celebration. Back in the locker room, the guys are high-fiving, hugging and slapping each other and we get in on the team picture. We also get an autographed game ball. Everyone heads out to party it up and show Dallas how it’s done. The next day we fly home, passed out on the plane and snuggling to our championship t-shirts. Or, I could get together with all my friends and watch the game the good old-fashioned way – on a high def big screen T.V. with lots of food and beer. Yep, that sounds perfect to me! 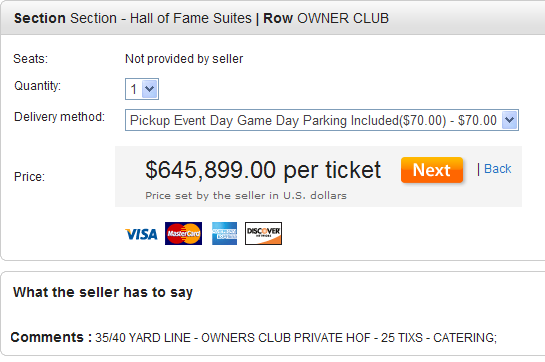 Don’t worry – I’ll throw in the $70 for parking. Hey, it’s the least I can do.